Is this a bus or a train? Hard to tell! Photo by World Resources Institute Staff. One of the hottest transportation debates in the region these days relates to the proposed Corridor Cities Transitway (CCT). The Maryland Transit Administration (MTA) envisions a 14-mile transit link roughly following I-270 from the Shady Grove Metro station in Gaithersburg to Clarksburg near Frederick County. MTA is considering both bus rapid transit (BRT) and light rail (LRT) alternatives. The project is part of a larger effort to reduce congestion and improve travel times in the rapidly growing area to the northwest of the District that extends to Frederick and beyond. That larger effort encompasses various proposed reconfigurations of I-270 and US 15 that could add HOV or general purpose lanes to the two roadways. The CCT debate is complicated by Gaithersburg West “Science City,” a Johns Hopkins University proposal to build 8 million square feet of life science research and development space that would more than double the county’s current inventory of such facilities. The project would support 60,000 new jobs as it is phased-in in the next 30-40 years. On November 17th, the Montgomery County Council voted 6-3 to support a LRT alternative over BRT for the CCT. Their preference for light rail echoes the growing trend of light rail projects nationwide. They also supported two reversible toll lanes that would be free for buses, carpools and van pools. The vote supported an amended CCT alignment that would route the transitway through Gaithersburg West. If MTA goes forward with the Montgomery County Council recommendation, the increased cost of the light rail choice could render the project basically unfundable from a federal standpoint. Indeed, the debate between BRT and LRT may be a hollow one. According to the Washington Post, the choice of LRT would double the cost of the project for virtually the same ridership. Image couresy of the Washington Post's Laris Karklis. A brief conversation about BRT vs. light rail for the CCT played out on radio station WAMU yesterday between EMBARQ Director Nancy Kete, and President of the Montgomery County Chamber of Commerce Georgette Godwin. Kete pointed to the EMBARQ-led Metrobus system in Mexico City which sports two bus rapid transit lines. That project took just three years to plan and launch and now serves 450,000 passengers per day, nearly half of the number of daily passengers who ride the D.C. Metro and at a fraction of the price of the heavy rail Metro system. 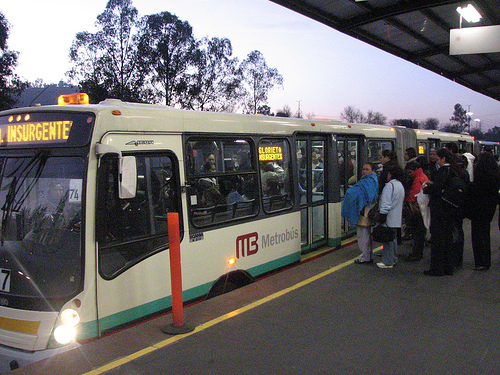 Fifteen percent of Mexico City’s BRT ridership are people who have exchanged their cars for the quicker bus service. Kete goes on to state that those unfamiliar with BRT should think of it “more like a rail system on rubber wheels.” Time savings brought through dedicated lanes and traffic light preemption combined with station platforms (pictured at the top) and other elements that mimic a rail user experience are all important components of any BRT system. Godwin and the business community feel that light rail represents “a permanent commitment” to transit that will trigger economic development and dense urban infill projects in a way that BRT will not.